Companies are struggling mightily to manage currency exposure in the face of rising exchange rate volatility. According to a study by risk management consultancy FiReapps , 846 Fortune 2000 companies that generate 15% or more of their international revenues in at least two currencies took a $4 billion FX hit to earnings in the third quarter. That’s a 14% increase from Q1. Through the first nine months of the year, the currency-related losses for these multinationals came to nearly $12 billion. Wolfgang Koester, CEO of FiReapps, noted that 59% of the treasurers of the 100 largest multinational companies polled by the firm several years ago said they tried to the limit the amount of their companies’ earnings subject to currency swings to a $0.01 per share. Koester explained that the penny-a-share limit stemmed from the treasurers' focus on meeting analysts' estimates. More than a penny of earnings might be just enough to miss those estimates—no matter how much a company made in a given quarter. The companies that comprised the 'FirReapps 800' fell fall short of the penny-a-share mark, however. That group of US multinationals lost more than 1.3% of their Q3 earnings to currency volatility during the third quarter of last year—the third in a row they experienced such a loss. 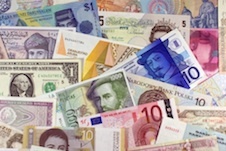 The killer currencies for US corporates in the quarter? The real, yen, euro, rupee and Australian dollar. The rupee made its first appearance in the top five this year, while the Australian dollar registered its second quarterly showing in a row. Koester said the FX volatility is related to the decline in the dollar's status as a reserve currency, which has produced less correlation among other currencies and the greenback. In past years, he noted, "If the dollar went up, everything else just went down." But Koester said that is no longer the case. The five industries most buffeted by currency swings in the quarter were medical equipment and supplies, autos, chemical manufacturing, biotech and drugs, and business services. Except for auto, all industries ranked in the top five in the two previous quarters as well. Not all companies within their industries face the same challenge, even if they share the same exposures. While Koester reports that technology distributors with narrow margins, such as Arrow Electronics and Avnet, monitor their cash flow exposure as often as three times a day, more profitable service providers such as Google and Accenture might look at it no more than twice a week. Koester also said that companies have become more consistent in their reporting since FiReapps began tracking their exposures almost three years ago. Once a company reports a negative hit to earnings, analysts come to expect insight into that business’ exposure in subsequent quarters —whether it’s negative or positive. Companies have little choice but to provide it, he explained. Some treasurers and risk managers choose to let earnings exposure to currency volatility ride in the expectation that the swings will offset each other over time. But Koester said "that's an unsophisticated view" that very few major multinationals hold these days. The change in attitude is understandable—given that investors react to negative surprises much more dramatically than they do to positive ones.